When the attractive chestnut Dolkong placed third in Round 3 of the G1 Maktoum Challenge sponsored by Emirates Airline on Super Saturday, it represented a pinnacle of achievement for a South Korean-trained horse. Just being part of the line-up for Saturday night’s Dubai World Cup sponsored by Emirates Airline is a dream come true for promoters of the sport in the American-bred’s adopted homeland. Not that it will filter through to a TV audience in his adopted country - where even local racing is not beamed live to homes - but to counteract this, the Korean Racing Authority will give his legion of fans an opportunity to watch him compete against the world’s best on the huge video screen at Let’s Run Park in Seoul at the admittedly challenging hour of 1:40 a.m. local time. “He is the most popular horse in Korea and we have many people talking about him in the mainstream media. His performances in Dubai have captured the imagination and we are very proud of what he has done,” Dr Seungho Ryu, the KRA’s international racing manager, noted. Overseeing the 5-year-old’s preparation is trainer Simon Foster. The Western Australian, who decamped to Seoul in 2017, is enjoying the ride and the associated attention. “He has gone from being a novelty item earlier in the Carnival to being placed in a Group 1 and deserving respect and his place in the big one, the richest race in the world. It is obviously his biggest test yet, but he couldn’t be in better form and we are really looking forward it,” the handler said on Monday. is four runs into his Dubai campaign. On this third start at Meydan in late February he routed a Listed line-up by almost 10 lengths to fuel connections’ hopes that he could feasibly seal a slot in the Dubai World Cup with a big run on Super Saturday. “It was a quick back-up, just nine days, into his last start and things didn’t go his way. He was a bit slowly out of the barriers and then he was caught wide in the run. But to his great credit he still stayed on very well at the finish,” Foster recalled. 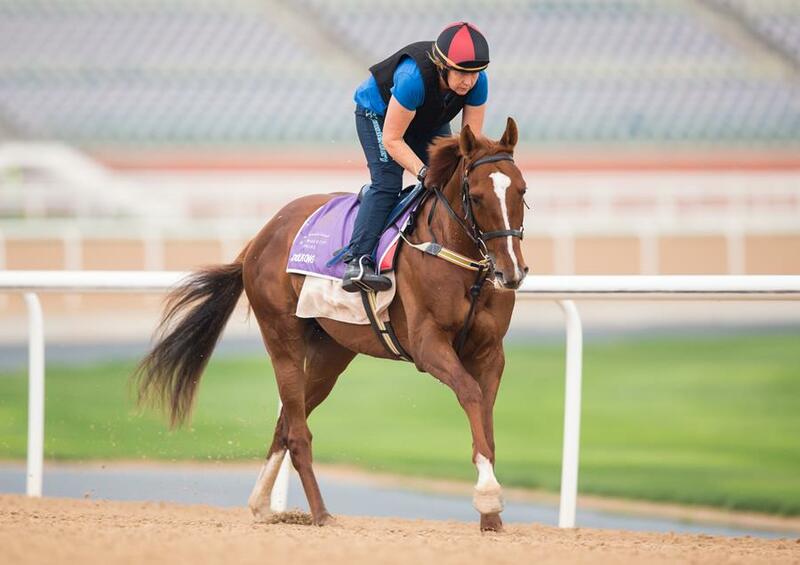 Foster is of the belief that a freshen-up of three weeks since that last outing will stand Dolkong in good stead and maintains his horse has thrived at Meydan since arriving in the Emirates just before Christmas. “He loves it here. I have never seen him better,” he enthused. Overseas bookmakers rate Dolkong no bigger than 25-1 for the Saturday’s showpiece. Ryu of the KRA is a little more circumspect and claims he would be happy for connections to collect a slice of prize-money stretching down to sixth place. Perhaps Dolkong’s never-say-die attitude makes this a realistic goal. Foster certainly thinks so. “We think the best is yet to come,” he concluded.